Pad Thai (Thai: ผัดไทย) is one of the most popular Thai dishes, but it is not really authentic. It was made up for tourists tastes but has become very popular throughout Thailand for travellers (perhaps second only to Tom Yum Goong). It’s also one of the most popular dishes around the world and is made in most local Thai restaurants along with Thai Green Curries and Thai Red Curries. It is a delicious dish of stir-fried rice noodles with eggs, fish sauce, tamarind, chillie, plus a crunchy addition of bean sprouts, shrimp/prawns, chicken (or tofu), garnished with crushed peanuts, coriander and a squeeze of lime or lemon. 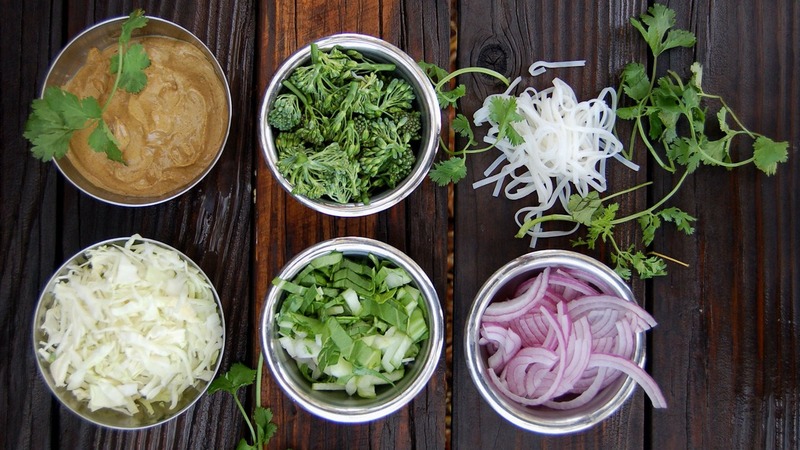 The secret to cooking with a wok is to have everything cut up to the proper size and have all of your ingredients within arms length of the wok. This way you do not need to leave the wok and everything can be cooked at the right time for the right time. Put noodles into a large bowl and cover with boiling water from the kettle. This will allow it to slowly cook without having to cook it on a stove in a saucepan. It will also leave the noodles slightly under-cooked, so that when you add them later to the wok and mix in the other ingredients, then the final cooking stage will occur. Let them soak in the pot and rinse them if they are starting to get overcooked. (It all depends on the brand of noodles and their thickness). Squeeze the lemon juice, and mix with the fish sauce, tamarind and sugar into a small bowl or jug. Whisk or stir until the sugar dissolves. It should only take a minute. Heat a wok over high heat. Add the oil and swirl the wok so the oil coats the upsides of the wok. Add the chicken and stir-fry for 2 to 3 minutes until golden brown. Remove the chicken to the side in a small bowl. Reheat the wok and add a little bit of oil and add the prawns, onions and chillies. Stir-fry for 2 to 3 minutes or until prawns turn pink. Add noodles and stir-fry for 2 minutes. Put the chicken back in along with the lemon juice mixture and toss everything to combine. Slowly pour eggs over noodles. Stir-fry for 1 minute. Add sprouts. Toss well. 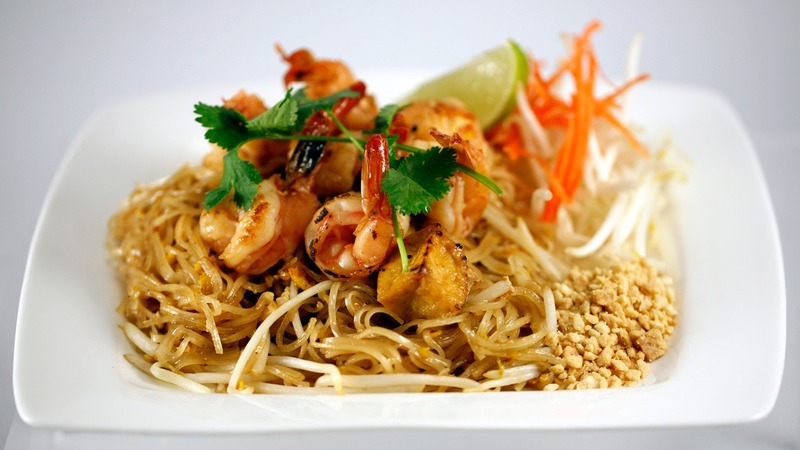 Taste one of noodles to ensure that they are cooked and then spoon the Pad Thai onto plates. Sprinkle with peanuts and coriander leaves. Serve with lime or lemon wedges. See the Best Food in Bangkok and other dishes apart from Pad Thai.